These days, with any mass movement, from terrorist organizations to student protests, you almost immediately have a sense of who is involved. Given the ubiquity of social media and the generally elevated level of surveillance, no modern day gathering, whether for legitimate protest, mass violence, or the shades in between, should be difficult to minutely dissect and analyze. Indeed, we have come to expect knowing everything there is to be known about an event’s main actors, their shared characteristics, and how they came to behave in the way they did. 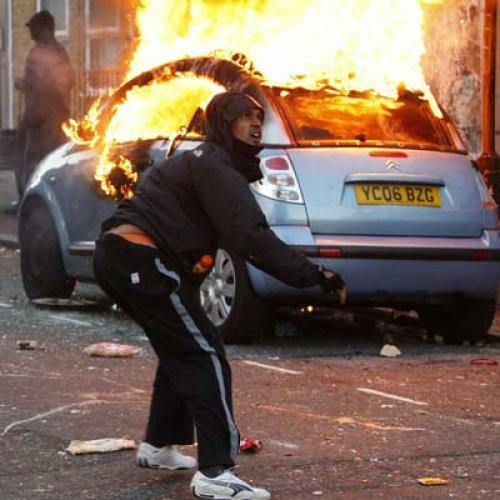 And yet, despite the incessant media coverage in Britain for the last three days, one of the most striking features of the reaction to the riots has been the lack of consensus on, or insight into, the people causing the chaos. After days of rolling news and dozens of opinion pieces, the language in the media has hardly progressed from the words initially used when the violence began in Tottenham on Saturday night: namely, that the perpetrators are “youths” and “thugs.” There is yet to be any clear idea of who the typical participant in these outbreaks is, and exactly what back-story could make this behaviour possible, or even appealing. Commentators have spoken of poverty, lack of education, disintegrating families, and cuts to youth services. But these explanations alone are too general, anonymous, and insufficient. Of course, an investigation of this kind is made incredibly difficult by the very fact that, to the extent these crimes do have a uniting grievance, it is that of being disconnected, or marginalized. Who do you speak to in an “underclass” defined by its invisibility and isolation, and currently even more suspicious than usual of press intrusion? To their credit, newspapers are advertising for personal stories and information; journalists are putting up their Blackberry pin or asking for parents of rioting children to email them. This is a positive development which demonstrates openness and a desire for fullness of commentary, but it also suggests a sheer lack of access or knowledge. So are the rioters long-term gang members, professional thugs, or pubescent brats with a taste for designer labels? One of the very few examples of hearing opinion directly from those involved has been the brief interview that Leana Hosea, a journalist for the BBC World Service, conducted with two teenage girls who had joined the looting in Croydon. How much of it was drunken bravado, playing up for the reporter, is unclear, but, overall, the dialogue was bleak. As one girl said casually of the looting, “Got a couple of free things,” and both laughed. Then one of the girls seemed compelled to provide a justification, explaining, “It’s the government’s fault,” to which her friend replied, “Conservatives,” and the first answered, “Yeah, whatever, who it is, I don’t know.” It was wave after wave of dumb defiance and bratty depressing swagger. But these girls were happy to chat, open, and confident in the pettiness of their crimes in comparison to others. Clearly they are on the more benign end of the spectrum. How many of the looters are like this, joining in gleefully once the tide has started, with a tiny smattering of anti-government sentiment at the very back of their minds? And what of the rest—the core of truly violent rioters, who smash in entire department store fronts, who throw bricks and flaming bottles? But perhaps this unsatisfying answer, this lack of coherence, is, in itself, instructive about the situation. These muggers, arsonists, and vandals do not articulate their cause. Nor do they, as might be expected, attack the richest areas of London—places like Highgate or Primrose Hill. Instead, they lash out, and they congregate close to home. There is no doubt that many of those arrested or who are still at large are violent, angry, directionless, and have long been on a path to self-destruction. The riots are an acknowledgement that something is wrong, something is consistently being kept from them, but by the very nature of their lives it’s not going to be a politicized movement, one that’s armed with statistics or which recognizes who the right targets should be to gain public sympathy. Their lives are chaotic and dead end, so they attack their neighborhoods in a way that mirrors this. They enact through pointless destruction the statistics that articulate commentators are starting to attach to them. These figures go some way to showing how dismal the picture is for those on the bottom rung—that this a country where the richest 10 percent are now 100 times wealthier than the poorest. Clearly, no politician is going to be caught emphasizing social policy at a time like this. Instead, from all the party leaders, we are being fed a steady diet of toughness, of how this is unacceptable, of how the first priority is to keep our streets safe and bring wrongdoers to justice. These are all the right sentiments, and no one is diminishing the fear felt and the money lost by the inhabitants of Tottenham, Ealing Broadway, Clapham, Peckham, Croydon, and now all over the country up to the Welsh border. But that doesn’t stop David Cameron’s speeches of both Tuesday and Wednesday from being depressing. In his address outside Downing Street on Tuesday, he insisted, “If you are old enough to commit these crimes, you are old enough to face the consequences.” A line such as this begs the question of when someone crosses over from being a victim to being a criminal, a problem. When they throw the first brick? Even if they are as young as ten, as some of the rioters allegedly are? And, if so, at five, or six, are they just a problem in waiting? If a law-and-order response to these riots is the only one taken in the weeks and months that follow, then we will return to the situation we have now in five years time, and in a decade, again and again.